Baby Magic Bath Time Gift Set | Multicolour | Gentle for all skin types and has that wonderful baby scent mommies have loved for generations. Gentle for all skin types, this baby bath gift set is exclusive and special. This set includes a baby lotion, hair and body wash, calming baby bath wash, and a squeaky duck pouffe. It includes everything that needs to stay clean while having a fun bathing time. 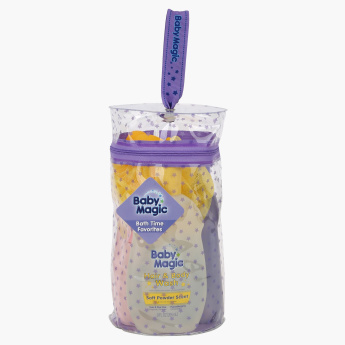 Feature 2 : Baby Magic’s Bathing Basics Bag baby bath set includes everything mommy and baby need to stay clean and have fun in the tub! Feature 1 : Gentle for all skin types and has that wonderful baby scent mommies have loved for generations. Feature 3 : Set Includes : 9 oz Original Scent Baby Lotion , 9 oz Soft Powder Scent Hair & Body Wash , 9 oz Calming Baby Bath , 2 oz Original Scent Baby Lotion , 2 oz Soft Powder Scent Hair & Body Wash ,Squeaky duck pouf .